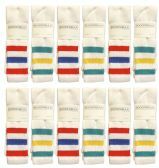 12 Units of SOCKS'NBULK Big And Tall Mens King Size Premium Cotton Extra Long White Tube Socks With Stripes Size 13-16 - Big And Tall Mens Tube Socks at low wholesale prices. alltimetrading.com offers Big And Tall Mens Tube Socks at bulk discounted prices. SKU: 2034897 Free same day shipping.